Across the world, the norm of having almost all of the politics shaped by only half of the population is being challenged. But when it comes to the politics of building peace, women are still being confined to the margins. In a country whose deadly civil war has revived divisions along regional, political and societal fault lines, working to ensure that all Libyans have a say in shaping the future vision and direction of their country should not be a radical proposition. Yet, this is still the case when it comes to advancing greater participation for women. Despite the active political role that women in Libya played in the revolution of 2011 that brought down the regime of Muammar Gaddafi, in the chaos of transition, their political space is being closed, their presence rejected, and their voices silenced. “Many women have become disillusioned, as the spaces women gained have been lost”, says Dr Elisa Tarnaala, Advisor to the Women in Peacemaking team, from the Crisis Management Initiative (CMI), an organisation founded by former President of Finland, Martti Ahtisaari, and working on preventive diplomacy and peacebuilding. The past six years has seen the situation in Libya deteriorate into a holding pattern of insecurity and violence. During that time, the numerous high-profile security interventions ‒ from which women have been largely absent ‒have, so far, not been able to effect positive changes in people’s day-to-day security. CMI had been organising various informal platforms for dialogue between Libyan politicians, political party members, civil society actors, tribal representatives, academics, and people from minority groups since 2014. Bringing people around the same table was yielding real gains in terms of trust and tentative friendships. Nonetheless, more widespread participation of women in politics and peace outside of the dialogue platforms was not materialising. At the start of 2017, a group of women who had been participating in the dialogues were invited by CMI to look at how to change this. At their first gathering in Tunis in January 2017, the women resolved to establish a group dedicated to finding ‒ and, if not, creating ‒ opportunities for women to shape the transition. The first order of business for the Women’s Working Group (WWG) was the idea for a national-level consultation to uncover the key issues for women’s peacemaking and political participation. Being able to relate to the different lives and experiences being lived by women across Libya was crucial. This meant ensuring that the WWG itself represented a variety of regions, professions, generations, education levels and political views; including women active in politics and civil society to shatter the myth that women could not and would not take on the responsibilities of a role in politics. A national-level consultation was ambitious, but with funding from the Finnish and Swedish foreign ministries and the Wihuri Foundation, CMI was able to recruit a coordinator to maintain momentum for the group and drive forward the consultation process. The task of planning the schedule, managing logistics, keeping up with the WWG’s online group chat, and keeping the women connected was taken on by Ghemera Krekshi, a former social worker working in the Prime Minister’s office, who splits her time between coordinating the WWG and working on psychosocial effects suffered by refugees. She talks with enthusiasm about repurposing her skills to advance the project and draw up the questionnaire that would frame the consultations. “My background in social work certainly came in handy to get us started” says Krekshi. In the spring of 2017, the WWG met to discuss the draft. 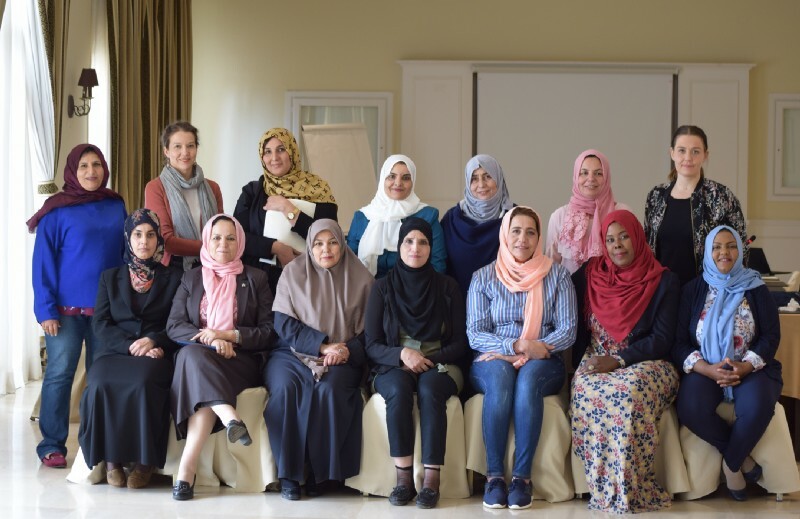 Thirty women travelled to Tripoli from across the country for one afternoon, filling the hall of a local cultural club, a last-minute venue sourced through “someone who knew someone who knew a place that could host us”. By May, the questionnaire had been finalised and the consultation had been launched. Members crisscrossed the country to survey over 500 women. They made contact through friends, at family gatherings, and during weddings and other social events to reach those that are usually left out of politics, in particular women living in rural villages and isolated desert communities. These consultations were the first of their kind and uncovered previously hidden insights into how women in Libya viewed their roles during and after 2011 and, more importantly, how they saw their future engagement in national reconciliation. By December 2017, the survey was wrapped up and the WWG came back together to take stock and strategise on how to use the results to advance women’s participation in a peaceful transition. One spin off has been the group’s activities around the elections that are due to take place in December 2018. Demand for the workshops where they have been publicising the results from the consultation is high. They are busy working with women’s representatives to develop political advocacy skills and meanwhile, five out of the twelve WWG members are, themselves, standing for office. Not everyone in Libya is ready to welcome the greater involvement of women in politics, peace and security. The heightened state of insecurity and violence across the country means that anyone who speaks up can incur more than social or professional repercussions. Undeterred, the WWG keep going with extraordinary energy and courage, managing jobs, studies, family lives and the demanding work of advocating for the freedoms, safety and meaningful participation of women as part of a peaceful future for Libya.